Working with crowdsourced freelancing has taught me a number of things that I wish someone had told me beforehand. While my experiences with Illustrator are purely self-motivated, I feel like there were a few things that should be taught in classrooms regarding scaleable graphics. I’m using this blog post as an opportunity to disseminate my newfangled knowledge of Graphic Design. This is a tutorial for the specific purpose of instructing other people on how to set up their workspaces for creating logos. Don’t worry. I did my research before writing this article. The first thing you want to consider is your client. This probably seems pretty self explanatory, but gather and organize all of the information you could possibly need before you even set about generating ideas for a project. I noticed that most sites provide a comments section for designers to ask job posters about a project. If you’re unsure about the file type or color palette that a client wants, don’t be afraid to ask. It’s better to win the project by being informed than to have it rejected. Sometimes small, but concise details in the job description explain important aspects of your work flow. If you’re lucky, you’ll catch any details you’ve overlooked before you turn your project in. In the worst case scenario, your project will get rejected because you failed to follow instructions. This is another thing that should be second nature, but can sometimes be overlooked. It’s important to keep a system for naming your files. When you have six different .ai and .eps files with the same name, you’ll begin regretting your disorganization. I can’t tell you how many times I decide to overwrite a file, and then reopen it only to realize that I destroyed hours worth of work in the wrong file. Starting with the right resolution is also much easier than resizing a canvas when you realize you weren’t paying attention to the client’s desired quality. Nothing’s worse than going back and monkeying with your native file just because there was a problem with the resolution. Also, be mindful of your compression settings when exporting your files. Interlacing your .pngs looks better, but comes with a lower level of compression. Projects that are being made for print won’t show up accurately if they don’t use Pantone Colors. Pantone is basically the universal standard for printer colors in CMYK. The printing itself comes in two flavors: Spot and Process color. Spot colors are colors that can be printed in a single pass so they don’t require a screen of different colors. They’re sometimes called “solid colors” for that reason. Process color requires greater accuracy because each of the different colors are lain down in successive passes. Graphic designers prefer spot colors for logos because they can be consistently replicated over large areas, and a variety of mediums. In other words, they’re more precise, and they adhere to brand identity better by being consistent. To switch to a pantone palette, first open your swatches palette, and Select All Unused. Some swatches are going to be left behind but that’s okay. Black ink will still be available on Pantone certified printers, so feel free to abuse greyscale. Just for frame of reference, black or (K100) is Pantone Process Black, because it isn’t a life or death situation if the printing registration is mismatched. 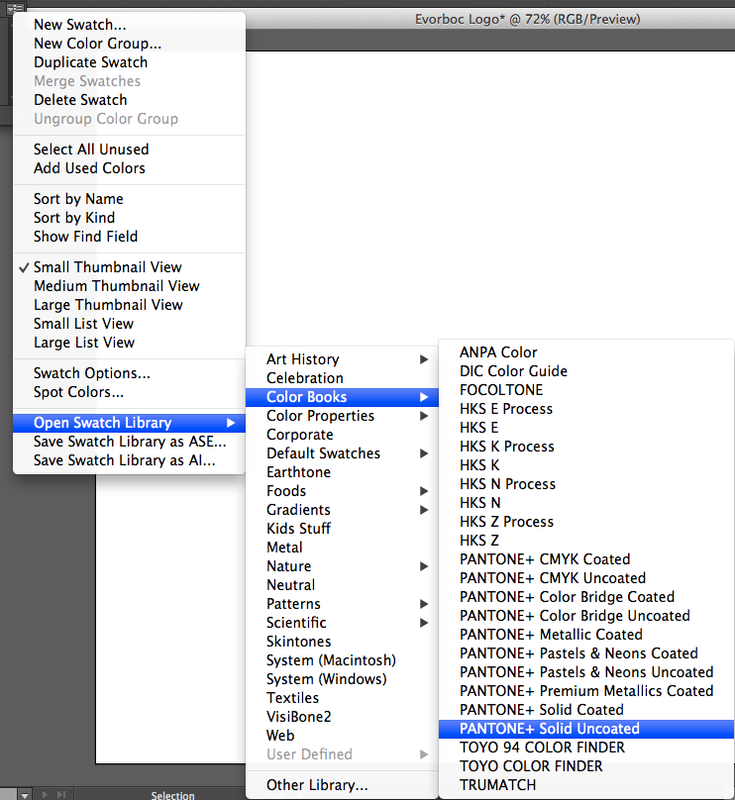 Finally, in your swatch settings, Open Swatch Library > Color Books > PANTONE + Solid Uncoated. Why solid uncoated? Pantone colors are either coated, or uncoated (and sometimes Matte) There are a variety of Pantone color books, but the other ones were already ruled out when we established that the best swatches for logos are spot (or solid) colors. Coated and uncoated refers to the stock that the colors are being printed on though. The whole crux of selecting colors is that ink is still slightly translucent (according to this article) and coated colors are designed for glossy paper, while uncoated colors are designed for uncoated paper. Selecting whether to use coated or uncoated colors ultimately boils down to collaborating closely with the client, but I’ve been using uncoated for the sake of consistency as long as a client doesn’t specify the palette. One look at “Metallic Coated” should tell you that these colors don’t look the same on your screen as they will in print. Clients need to be able to manipulate files. Files won’t be scaleable or useable if they have raster elements, open outlines, or fonts that aren’t compatible with certain computers. Open outlines and raster elements are a question of design. Make sure everything uses vectors, and that your layers are neatly organized. Since I used an unusual font, I had to outline the text before submitting my file. To do this, select the text and go to Type>CreateOutlines. This basically means that your text has been turned into a vector graphic just like any design you could’ve made with the pen tool or pathfinder. Finally, do yourself a favor and select everything so you can see stray shapes or anchor points. It seems like such an easy thing to do, but that’s exactly why it’s the easiest step to forget. Not only will stray marks look sloppy when a client tries to edit a design, but they can really mess up the organization that you tried so hard to achieve. Creating logos isn’t as easy as it looks. It takes as much creativity as any other project because you need to express yourself in the simplest and cleanest way possible. I hope this tutorial can be of help to someone just starting with graphic design. If I provided any misinformation, or if you just have a question, feel free to drop a comment. Subscribe to this blog, or follow me on twitter for future updates. This entry was posted in Tutorials and tagged Design, file, how to, logo, outline type, pantone, setup, tutorial by patbart. Bookmark the permalink.